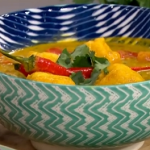 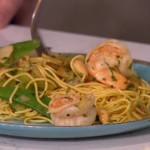 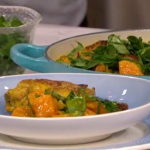 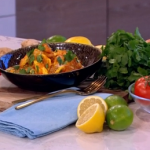 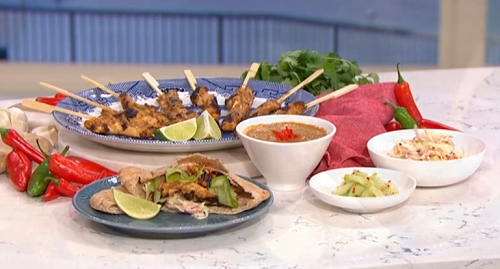 Gok Wan served up tasty chicken satays with Asian slaw and cashew butter on This Morning. 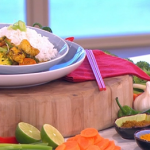 The ingredients for the satay are: 4 x chicken breast, cut into slithers and bashed, 170g smooth cashew nut butter (you can also use almond, pistachio or peanut butter), 1 tbsp oyster sauce, 2 tbsp light soy and 1 tbsp dark soy sauce, 1 tsp honey or agave syrup, Lime juice and zest, 1 garlic clove, grated, Small piece ginger, grated, Pinch rock salt and a pinch of white pepper, 1/2 tsp mild curry powder and add a little coconut milk or cream to make a dressing. 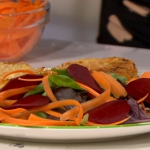 For the Asian Wasabi slaw: 1 small white cabbage, shredded, 1 small red onion, shredded, 2 carrots, shredded, 3 heaped tablespoons low fat mayonnaise, 1 tbsp Wasabi to taste and pinch black sesame seeds. 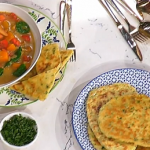 To serve: cucumber salad and wholemeal pitta breads. 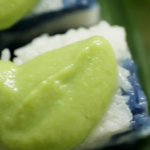 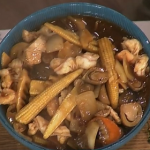 See Gok’s recipes in his book titled: Gok Cooks Chinese available from Amazon now.